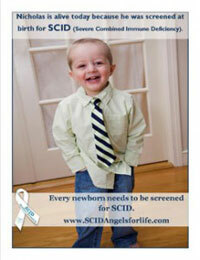 Our guide for parents following a SCID diagnosis is now available in English and in Spanish! Together with the Immune Deficiency Foundation we partnered to develop this guide for families. The purpose is to have it used and distributed by Immunologists, Pediatricians and State Health Departments across the United States. To view the brochure you can click on the link below or to order your FREE hard copy, please email Heather Smith at Heather@SCIDAngelsforlife.com. If your interested in receiving large quantities to distribute, please contact IDF at 1-800-296-4433 and they will gladly supply you with as many copies as you need.